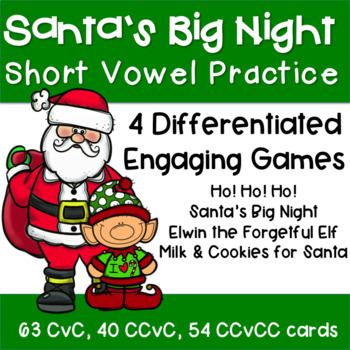 Santa's Big Night allows you to create 4 engaging, exciting CVC, CCvC and CCvCC word center games with one set of cards. HOW? 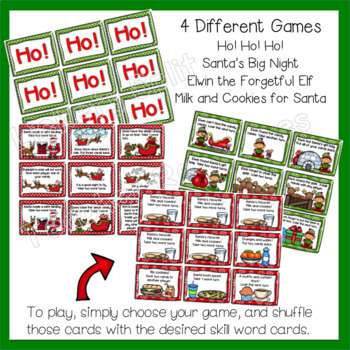 The trick is that the same skill word cards are used in each of the four different games! Simply choose the game that you want to play and add just those cards to the desired skill cards. 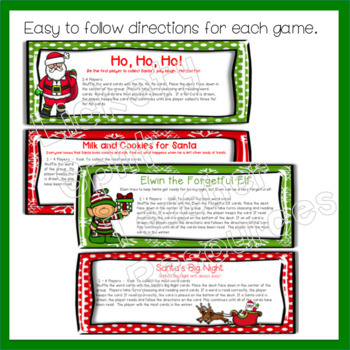 Less card stock, less ink, less laminating (and cutting!) and less of your time is needed. YAHOO! 1. Ho! Ho! Ho! 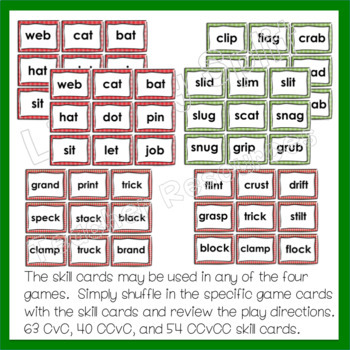 - Players take turns reading the skills word cards and attempt to be the first player to collect the words Ho! Ho! Ho! 2. Santa's Big Night - Santa's night doesn't always go smoothly! The goal of this game is to be the player with the most word cards at the end of the game. Players take turns reading the skill and game cards. They must follow the directions on the game cards. The cards have positive and negative outcomes. 3. Elwin the Forgetful Elf - Elwin tries his best to help Santa get ready, but he is very forgetful. The goal of this game be the player with the most cards at the end of the game. Players take turns reading the skill and game cards. They must follow the directions on the game cards. The cards have positive and negative outcomes. 4. Milk and Cookies for Santa - Everyone knows Santa likes cookies, but what happens when he is left other goodies? The goal of this game be the player with the most cards at the end of the game. Players take turns reading the skill and game cards. They must follow the directions on the game cards. The cards have positive and negative outcomes. I hope that your students enjoy learning with these games as much as mine do! Please click the link below to follow my shop. I will let you know about Freebies, new products, and updates.